The following health issues are typical of the breed, the most prevalent being Heart (Mitral Valve) disease. Breed-wide, the average lifespan of a Cavalier is about 9-12 years. With the exception of Syringomyelia, the following problems are diagnosed through simple, non-invasive, inexpensive, readily available, and painless tests. The breeder will tell you what health clearances have been performed on the MOTHER and the FATHER of any litter you are considering (puppies are too young for health testing to be meaningful). Ideally, both parents should be over 2 1/2 years at the time of examination and the clearance certificates should be dated within the year – copies of whatever health clearances have been done should be willingly provided to you in writing for future reference by your veterinarian. Many low cost health clinics, sponsored by the various Cavalier Clubs, are easily accessible to all breeders throughout the Northeast Region. Therefore, walk away from any litter you are considering where the PARENTS of the litter have not recently been cleared by a Cardiologist and Ophthalmologist, as a minimum pre-requisite. Breeders of the puppies listed on this East Coast Puppy Referral site have been required to provide documented evidence of clear cardiologist and ophthalmologist certifications for mother and father of the puppies listed. Diagnosis should be done by a Board Certified Veterinary Cardiologist, dated within the year, for the MOTHER and FATHER of any puppy you purchase. Mitral Valve Disease is progressive and can be early onset in this breed. The good news is that just because your Cavalier develops a murmur does not mean the dog will die. As the murmur progresses there are a multitude of effective heart medications to help your Cavalier live a long, symptom – free life. Diagnosis should be done by a Board Certified Veterinary Ophthalmologist, dated within the year, for the MOTHER and FATHER of any puppy you purchase. Eye issues in Cavaliers are not prevalent. Juvenile cataracts and retinal dysplasia or folds are found on occasion. Diagnosis should be done by a General Practitioner annually for the MOTHER and FATHER of any puppy you purchase and is the easiest of all the tests to be performed. Known also as slipping patellas, it is seen mostly in Toy breeds. Severe patellar luxation will require expensive, but successful, surgery and is often symptomatic in young Cavaliers therefore it is important to know that the PARENTS are clear. Mild patellar luxation may not cause much, if any, discomfort but these dogs should never be bred as they could pass along a more severe version which will need surgery. Diagnosis should be done by X-rays taken on the MOTHER and the FATHER at 2 years of age or older and sent to the Orthopedic Foundation for Animals (OFA) for evaluation. This one time diagnosis is considered good for life. X-rays taken under 2 years are considered Preliminary diagnosis and it is recommended that the hips be re-evaluated at 2 years. The only definite way to diagnose syringomyelia and the associated skull malformation is by a MRI scan. Unfortunately this invasive, expensive test, usually performed by a neurologist, is only available at specialist veterinary centers. The most common sign of this condition is shoulder/neck/ear scratching (with no evidence of skin or ear disease), especially when excited or walking on a lead. Other symptoms may include sensitivity around the head, neck and forelimbs. DEAFNESS - Total deafness is rarely congenital (present at birth) however it is inherited. 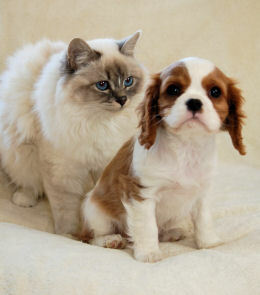 Cavalier deafness is usually of a partial and/or premature nature. 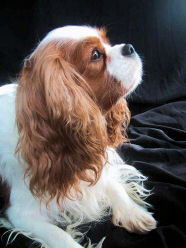 Some Cavaliers become totally deaf by 6-8 years. BAER testing is available to assess hearing loss. IMMUNE SYSTEM - These disorders can include, but are not limited to, allergies, digestive or metabolic disorders, dry eye, cancer, fertility, muscle or nerve disorders, thyroid problems, blood problems (mainly autoimmune hemolytic anemia and/or thrombocytopenia), etc.